HNPDC hood is designed to extract heat and fumes only. It does not have filters or condensing plates, thus it is not recommended for kitchen environments with excessive amounts of grease particles and steam. Only used in light duty areas. 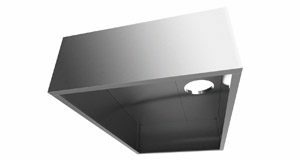 Exhaust hoods are constructed from AISI 304 stainless steel. AISI 430 version is also available. Exhaust hoods come fully assembled.